The dive site Dreadlocks Reef is an offshore rocky reef in the north Oudekraal area on the Atlantic Seaboard of the Cape Peninsula, near Cape Town in the Western Cape Province of South Africa. The site is colourful and fairly spectacular, and is specially notable for the relatively large colonies of the Dreadlocks hydroid Myriothela tentaculata. The depth is suitable for entry level divers. 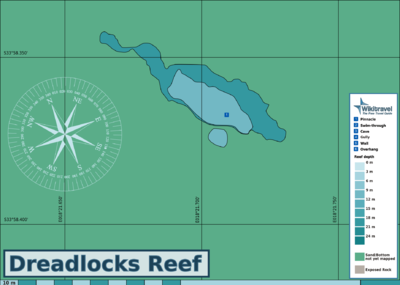 The site was named "Dreadlocks Reef" after the Dreadlocks hydroids found there in unusually large numbers. Visibility will depend on weather conditions, and may be in excess of 15m on a good day after an offshore wind and upwelling. Large corestone ridge with low surrounding reefs. The pinnacle is quite pointy, and the tip is only a couple of metres across. Ridge axis bearing 300°T (324° magnetic), ridge length 50m and width 20m at 12m deep. Length at bottom about 100m, width not known, but probably about 40m at widest. There is a smaller pinnacle a few metres to the south about 10m diameter at 12m depth. The SAN charts indicate another high reef about 200m to the north-east of Dreadlocks pinnacle, but this has not yet been mapped. The site is exposed to westerly winds and swell.so should be dived in calm or offshore winds, when the swell is low, and is often good in South Easterly winds. The site is reasonably protected from easterly seas. The site is usually at it's best in summer but there are also occasional opportunities at other times of the year. This is an area which sometimes has upwellings of clear cold water, caused by offshore winds, resulting in good visibility and low temperatures, sometimes followed by algal blloms which will reduce the visibility again. Usual access is by boat, but it could be dived from the shore by very fit divers in good conditions. The shortest distance to the shoreline is about 620m, but this may not be a suitable point for entry and exit. The site is about 12km from the Oceana Power Boat Club slipway at Granger Bay, or 16,4km from Hout Bay harbour. The upper regions are covered in the usual large red-bait pods, and there is a light growth of kelp above about 12m depth. Lower areas are encrusted by sponges, colonial ascidians, sea fans, anemones, small red algae, crustose corallines, hydroids, bryozoans and echinoderms. The flatter deep reefs are heavily covered by sea cucumbers and sea urchins. Small shoals of Hottentot seabream can be expected. A variety of nudibranchs and other gastropods can be found. Macro photography is likely to yield good results, and if the visibility is good, wide angle scenic shots should also turn out well. The site is not very large: Start by going down to the bottom of the ridge, and swim round it looking for Dreadlocks colonies, then continue round as you ascend, and do your safety stop at the pinnacle if conditions allow. No special skills required for boat dive. A dry suit or 7mm wet suit is recommended, as it will usually be cold. If visibility is not very good a DSMB will help the boat find you when you ascend. This page was last edited on 19 February 2011, at 09:32.